A/Prof Bruce Pennay's interests focus on two broad topic areas: the cultural heritage of the NSW/ Victorian border region; and post-war immigration history and heritage with particular reference to Bonegilla Reception and Training Centre in Wodonga. In 2001 Bruce Pennay was awarded a Centenary Medal 'for service to the Centenary of Australia celebrations'. In 2005 he was made a life member of the History Council of New South Wales. In 2009 he was awarded a Medal of the Order of Australia 'for service to the community of the Albury Wodonga region, particularly through the establishment of the Bonegilla Migrant Reception Centre Heritage Park'. 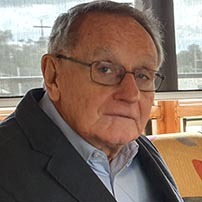 In 2009 the History Council of New South Wales awarded him the Annual History Citation 'in recognition of his contribution as a historian and practising heritage consultant, in particular his service to heritage and community history in regional New South Wales and Victoria'. In 2009 he was honoured with a Fellowship of the Federation of Australian Historical Societies for 'making an exceptional contribution to the understanding, preservation and promotion of Australian history through the historical society movement'. 'Wodonga's Bonegilla' Victorian Historical Journal 87 (1) June 2016.
' "But no one can say he was hungry": Memories and representations of Bonegilla', History Australia 9 (1) April 2012. 'Selling Immigration: Bonegilla Reception and Training Centre', Victorian Historical Journal 81 (1) June 2010. 'Framing Block 19 Bonegilla for Tourists and Local Visitors', Historic Environment 21 (3) October 2008. Picturing and Re-picturing Bonegilla, Wodonga City Council, 2016. Sharing Bonegilla Stories, Albury Library Museum 2012. Albury-Wodonga's Bonegilla, Albury Regional Museum, 2001. The Experiment: Imagining the Albury-Wodonga National Growth Centre, Albury Library Museum, 2013. Making a City in the Country, University of NSW Press, 2006. Three Shires and Their Councils Triple D Books, 2006.
, 44 (1) March 2013. Bruce is pursuing a number of self-funded and community heritage funded projects.